STRAWBERRIES ARE $22.50 PER POUND AVAILABLE BY ORDER OR WALK-IN BASIS. 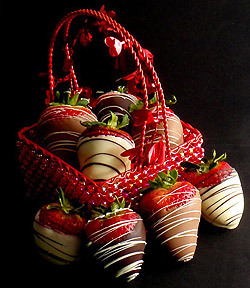 Chocolate Dipped Strawberries are always available! Few people biting into a piece of chocolate today consider the Ancient Mayan and Aztec heritage of this epicurean delight. Chocolate, recognized as a source of pleasure and nourishment, has passed from Mayan Gods, to European Royalty and great inventors, to land squarely on the tongues of the American Public. We, at Theobroma Chocolatier, are committed to continuing the traditions established in the Mayan jungles 3500 year ago to perpetuate and nurture the joy that experiencing fine chocolate brings. Please visit us and partake in The Food of the Gods. Don’t see what you’re looking for in our site? We’ve got too much chocolate to put online! Come by or store on Montgomery and Tramway to get a peek or call 505.293.6545. Follow Us on Facebook. We’d love to stay in touch.